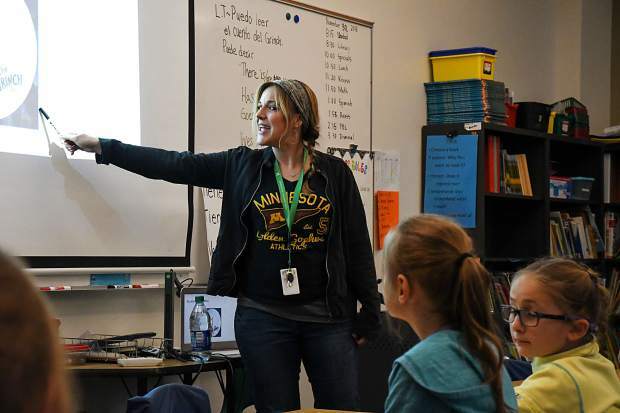 Two Rivers Community School Spanish teacher Shelly Haddon uses The Grinch to teach a Spanish lesson in her class at the Glenwood Springs charter school on Friday afternoon. A years-long effort to bring local charter schools into a formal relationship with the Roaring Fork School District will continue, but what the final result will be is anyone’s guess. With help from facilitators from the Gates Family Foundation, RFSD Superintendent Rob Stein began the process in fall 2016 to bring charter schools and the district together to work on important issues and improve education throughout the region. After two years of conversations, the compact between charter schools and the district passed a milestone last week as the boards for Two Rivers Community School in Glenwood Springs and Ross Montessori School in Carbondale chose to continue working with the district toward a formal compact. A compact might include anything from simply a shared enrollment schedule to an agreement to share mill levy revenue. Shared enrollment schedules would reduce paperwork and uncertainty like double enrollment. In addition to shared mill levy and bond funds, the district would consider sharing food services, bus systems and other infrastructure. The Gates Foundation has assisted 18 school districts across the country to develop compacts with the charters in their district. But the Roaring Fork Valley would be the first rural school, according to Ana Solar, the Gates senior program officer who is facilitating the discussions. For some leaders of the two independent charter schools, Ross Montessori and Two Rivers, which are authorized by the Charter School Institute (CSI), a compact that would relinquish charter school authority to the larger school district is cause for concern (Carbondale Community Charter School is part of RFSD). Though there was no formal vote at a Thursday joint meeting of the school boards from Ross Montessori and Two Rivers Community School, which Stein and the executive director of CSI also attended, the boards agreed to four more facilitated sessions to consider a formal compact. Some board members likened the upcoming process to diplomatic negotiations between nations. The goal in seeking the compact has largely been accomplished, Stein said in an interview. The conversations have already resulted in “improved relations and increased communication among all the schools in the valley,” which has benefit because the schools are part of the same community and serve the same families, Stein said. “The advantage of a compact would simply be to formalize agreements about how we could work together better, and work through shared goals,” Stein said. The school district and the CSI charter schools are getting along amicably now, but that wasn’t always the case, according to several people who were involved in forming the charter schools. Under previous superintendents, leaders of the current charter schools felt their voices went unheard, which is part of impetus behind forming independent schools. The history of charter schools in the valley shows the importance of charter school autonomy and competition, according to Rebecca Ruland-Shanahan, co-founder and head of school at Two Rivers. Having good charter school alternatives in the valley has improved the district schools as well, Ruland-Shanahan said. “When you have choice and when you have high-quality schools, you change the educational ecosystem, and that’s good for all kids,” Ruland-Shanahan said. During the process to form Two Rivers around 2013, Ruland-Shanahan said the district saw the community’s response to her proposal for expeditionary learning, and implemented it at Glenwood Springs Elementary. Stein was not active in the district then but also credited Ruland-Shanahan with bringing that learning philosophy to the area. After Two Rivers opened in 2014, the district took notice and implemented a lot of the school’s model at the new Riverview School, like discovery-based learning and bilingual education, Ruland-Shanahan said. “In my mind, competition makes you stronger, makes you better. So there’s no hard feelings at all,” Ruland-Shanahan said. Stein agreed that the district schools have improved. “But it may not be competition, it may simply be observation and imitation,” Stein said. When one school does something good, all schools benefit, he said. One idea for the compact would be for the district to share tax revenue from local mill levies. Funding charter schools without mill levy funding is a challenge. The state recently created a small fund of $5 million for CSI schools, but future investment will be subject to annual appropriations. Sharing tax resources is a sticky proposition for both the district and the charter schools. For RFSD, sharing current mill levy funds with charter schools could reduce the per-pupil funding for the existing public schools. For the charter schools, the strings attached to consistent resources might be too great. The question now is whether a formal agreement like a compact will be beneficial for all kids, Ruland-Shanahan said. Like Stein, she sees every school as a part of community development, but thinks committed educators are more creative when they aren’t being micromanaged by a district. “There was something very exciting and refreshing about having the autonomy to do what you as a stakeholder knows needs to happen, without being micromanaged by the district,” Ruland-Shanahan said. Separate from the compact effort, the RFSD Board of Education voted Wednesday to seek approval as an Exclusive Chartering Authority (ECA) from the Department of Education, which would make it far more difficult for new schools to form in the Roaring Fork Valley without the district’s approval. It would not affect the independence of the current CSI schools. Becoming the ECA would mean future charter schools would have to apply first to RFSD. If the school district rejects the proposal, the prospective school would be able to appeal to the state, but the process is far more complex. The ECA doesn’t prohibit charter schools from forming without district approval, but “it makes it much harder if the district doesn’t approve the charter,” Stein said at the RFSD board meeting. “It gives the district more control, and it creates more obstacles for a potential charter applicant to become authorized through other means,” he said. Out of 178 school districts in Colorado, RFSD is one of eight that do not have exclusive charter authority. Stein’s pitch for authorizing future charter schools is similar to his mission with the compact. First, being an ECA would offer funding equity across public and future charter schools. Second, it would force full cooperation on equality issues like balanced enrollment of underprivileged students, he said.